I am writing outside tonight, enjoying the faint breeze on a warm, southern summer night. I have been awaiting tonight’s supermoon to make an appearance just over the tree line, beckoning me as always. As I sit and wait, I begin thinking back to last year’s first supermoon. I spent that night serendipitously in the tower of a retreat house, spread out on the floor of the meditation room which had a full-circle window view of the mountains surrounding. The moon was my companion from one horizon to the other as I spent a night lost somewhere between deep meditation and dream-filled sleep. If, in all of my life, I could have planned a place to be for a spiritual experience it would be in that particular set of circumstances. But, I had planned none of it. It just presented to me as a gift of Divine Presence at a time when I was unfolding into a new calling in my life. I went back just now and read the blog entry that I wrote just after that experience. I could close my eyes and viscerally return to that time, which admittedly still does feel like half dream and half reality. An intense contemplative experience can be that way, as I have come to learn more fully in the year since. That will be with me for a lifetime. Tonight’s supermoon now seems to rise in the sky with a delightfully cool breeze wafting through the warm air. I close my eyes and breathe it in, as I sit in the best possible place to view the moon…which right now happens to be on the wooden boards of my back patio. I am situated between one large planter overflowing with pink and orange lantana in the center of trailing vinca and a climbing mandevilla that shows off its prolific pink blossoms as it reaches out to join a lattice of jasmine; the flowers are still vibrant even here in the moonlight. The luminous moon moves through the branches of a crepe myrtle as it rises into the night sky. It truly is glorious here in the night air, with my own little patch of nature-in-the-city to keep me company. My mind wanders as I contemplate the moon. Light in the darkness…I know that is what draws me in. The moon is richly symbolic in so many ways, but that is the message that imprints time and again on my spirit. I write so often here about life and loss; hope in the midst of despair; grace and growth emerging from our brokenness. The moon is a symbol to me of these truths and juxtapositions that I hold in my soul. They are divine gifts, and I feel both grateful and responsible for their movement through me as I journey through this life. The full moon always reminds me of this, pulling me fully into the depths of that calling. My mind travels again, and I am young. I am spending a summer night “camping out” at the farm where my Gramma and Aunt Joyce live. My parents have bought a tiny camper and we will set off for our first actual camping soon. But, that summer night, we were parked in Gramma’s big back yard just practicing. I am just a few weeks into my sixth year. I walk along the yard, next to the barn. I notice that the moonflowers in my Aunt’s garden have just started to open as twilight falls and the moon rises over the open fields and rolling hills of upstate New York. Each moon flower untwists, magically, as night falls. I am pulled in, even then, to the nature and spirit that surrounds me. I caught a glimpse of that, even in my childhood wonder. The moon rises higher, and I can move to a civilized patio chair now and sit back in contemplation, open to what speaks to my soul tonight. The night is for stillness…let us be still in the presence of God. Words from Night Prayer in A New Zealand Prayerbook fill my thoughts. I smile as I realize how appropriate it is that I recently began a study of Compline, which has been my nightly closing prayer for the past year. Rich with images of darkness, light, and Divine Presence…I am reminded that this, too, is an expression of who I am in the spiritual, religious, and vocational threads of my life that continually weave together. Beckoning moon, always reminding me of who I am at my core. I bask tonight in the light of a supermoon, and listen for the still, small voice carried on the breeze that speaks so fluently and directly to my soul. This entry was posted in Spiritual journey and tagged calling, compline, Contemplation, darkness, faith, God, light, moon. 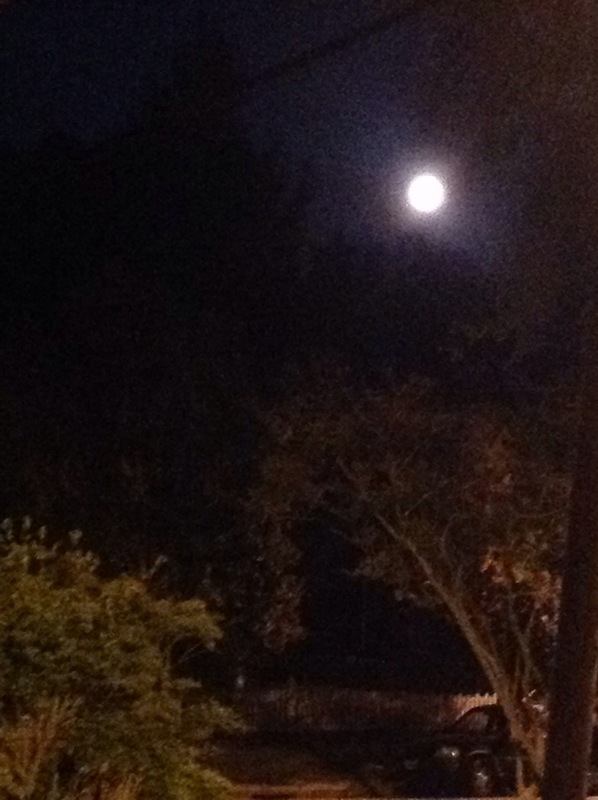 supermoon, nature, photography, reflection, spirit, spirituality, vocation. Bookmark the permalink.